For today’s Feature we have a top & bottom octopus graphic created by Jessica G. Robles at BoardPusher.com. “I wanted to play the common concept of an octopus being in a bathtub but with a fun galaxy twist; especially since octopuses are very alien-like.” You can view Jessica’s portfolio at jessgrobles.myportfolio.com or follow her on Instagram @jess.g.robles. 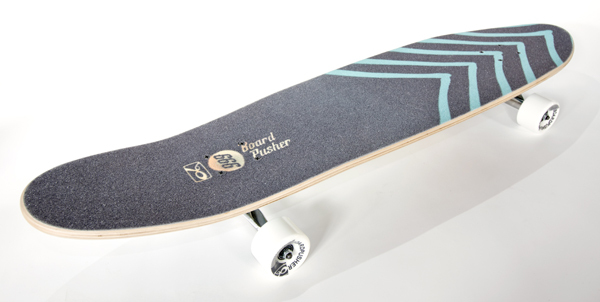 Design a custom skateboard graphic and matching griptape at BoardPusher.com. Today we have a top and bottom graphic for our BoardPusher.com Featured Deck & Griptape. Jerome Aris creates with various mediums and he added two of his pieces to a plaid background and matched it with some custom griptape. Check out Jerome’s website arisjeromestudios.com where you can find a lot of his photography or follow him on Instagram @arisjerome which has links to his various projects and styles. Create your own top and bottom graphic with a custom skateboard design and matching griptape at BoardPusher.com. 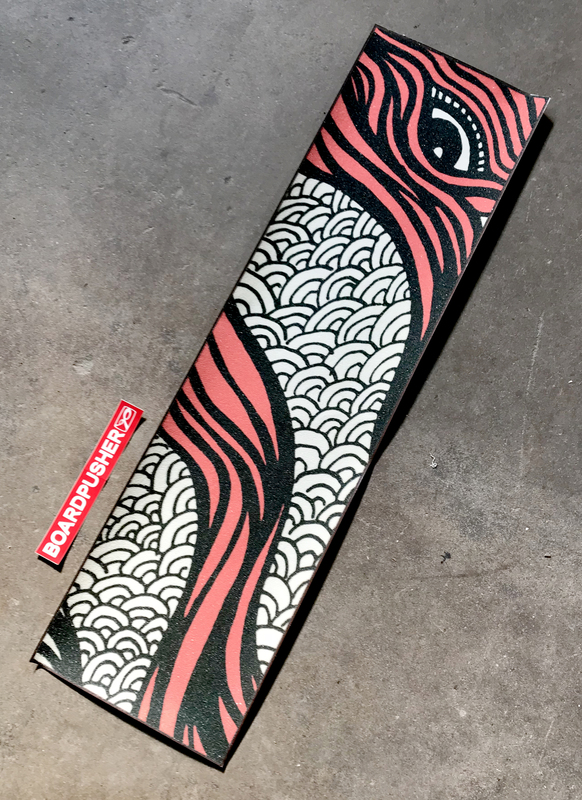 Today’s BoardPusher.com Feature is a sheet of custom griptape designed by Blaze Ben Brooks. “I love drawing anything and everything. From portraits of celebrities and my friends lookin’ mighty fine, all the way to crazy lookin’ cars and drunk cartoon characters.” View Ben’s website at blazebenbrooks.com or follow him on Instagram @blazebenbrooks. 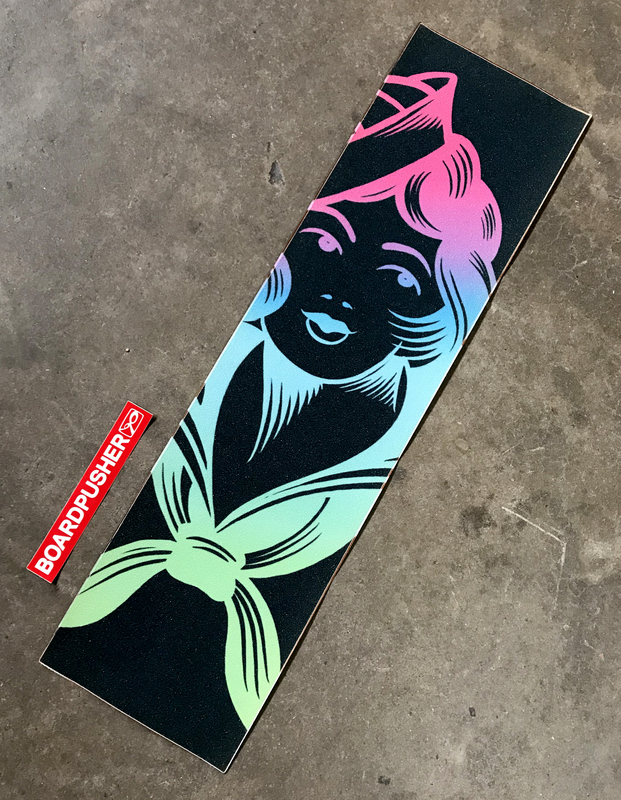 Keep the top of your deck looking fresh with some custom griptape you can design at BoardPusher.com. 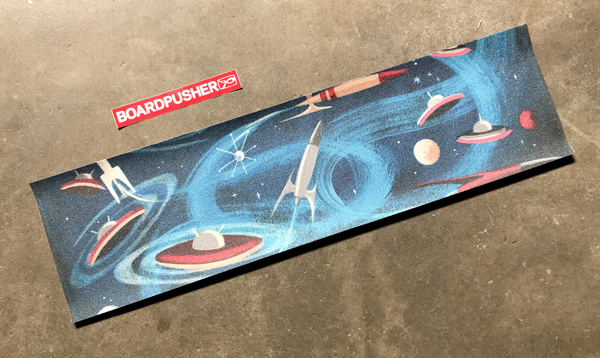 El Gato Gomez is an artist with a penchant for “vintage pulp style sci-fi art with lots of rockets, robots, and flying saucers” as exemplified by today’s BoardPusher.com Featured Custom Griptape “Rockets”. Señor Gomez also dabbles in “retro pinup girls, Eames era interior design, kitschy classic TV, campy 1950’s “B ” horror monster movies, funky Googie architecture, Tiki bar idols, mod abstracts, and cool cool beatnik kitty cats” all of which you can see at elgatogomezart.com or by following him on Instagram @elgatogomez_art. You can also pick up any of El Gato Gomez’s skateboard or griptape graphics at BoardPusher.com/shop/elgatogomez. Add custom griptape to your arsenal of custom skateboard designs by creating your own at BoardPusher.com. Happy 4/20 (have fun and be safe). 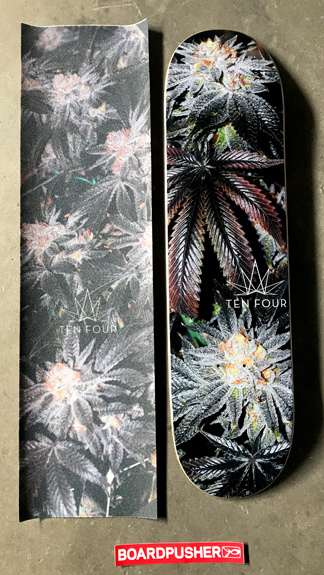 We thought this top and bottom graphic combination by Ten Four Farms would be an appropriate Featured Deck and Custom Griptape for those of you celebrating today. Ten Four Farms “is a Tier 1 OLCC Licensed and Portland City certified indoor cannabis producer” and you can find out more at their website tenfourpdx.com. Create your own top and bottom graphic by designing both a custom skateboard and custom griptape at BoardPusher.com. Today we have some custom griptape added to our BoardPusher.com Featured Deck. Both were designed by Dave Benedict of squareeggvisions.com for his son. “I was commissioned to do a logo for a band that was looking for a name change. Fire Lake was the name they came up with, so I made the logo first and then was inspired to make a poster for them. Unfortunately the name was turfed and they decided to stick with their original name. 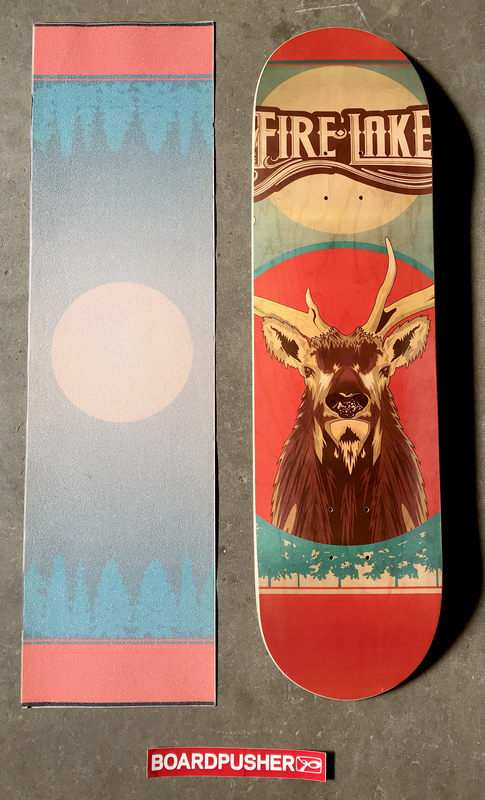 I was a little bummed that my design didn’t get used so when my 12 year old son decided to take up skateboarding and I decided to relive my youth through him, I wanted to have a board that was one of my designs. This was the one he picked out of about 7 other designs I had mocked up.” Good choice. You can follow Dave on Instagram @davecbenedict or his design firm @square_egg. 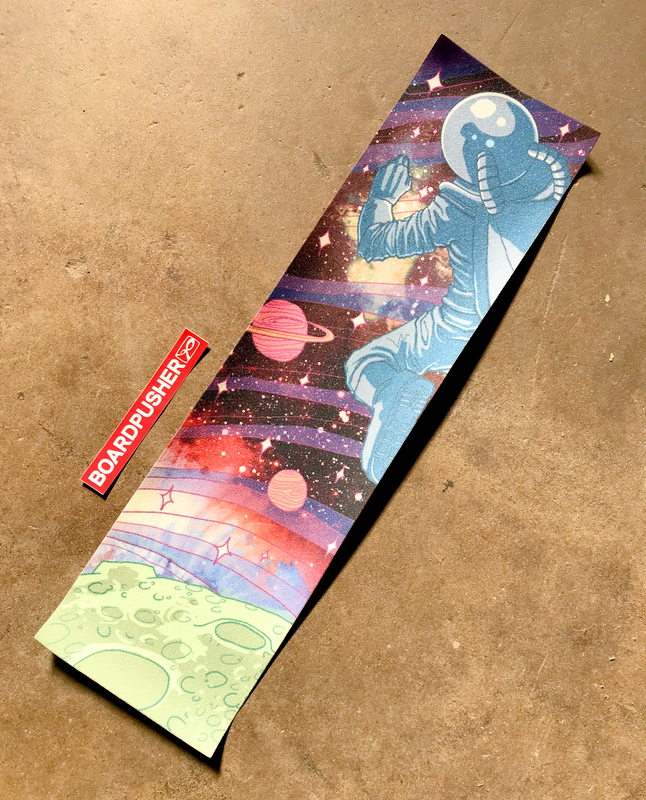 After you’re done designing your own skateboard at BoardPusher.com try creating a top image with a custom griptape graphic here. Squad19 is a collective started by Minneapolis based artist Steve Tenebrini. Together they have collaborated to send several graphics through our presses. For today’s BoardPusher.com Featured Griptape, they took advantage of our different grip sizing options and produced one of their sketchbook graphics onto a 10 x 36 inch sheet that fits wider/longer shapes like our punk nose deck. 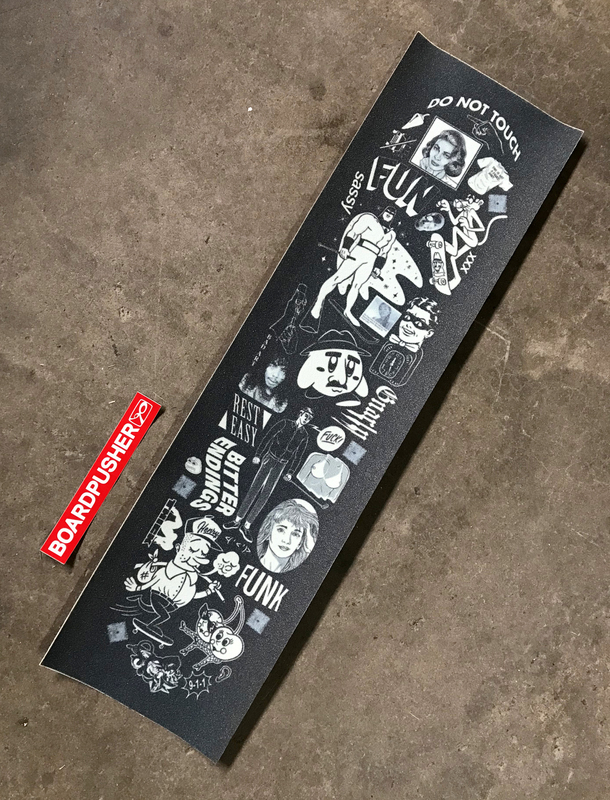 Find more griptape and skateboard graphics from Squad19 at Boardpusher.com/shop/Squad19. We offer griptape on sheets of 9 x 33 inches, 10 x 36 inches, and 10 x 43 inches. 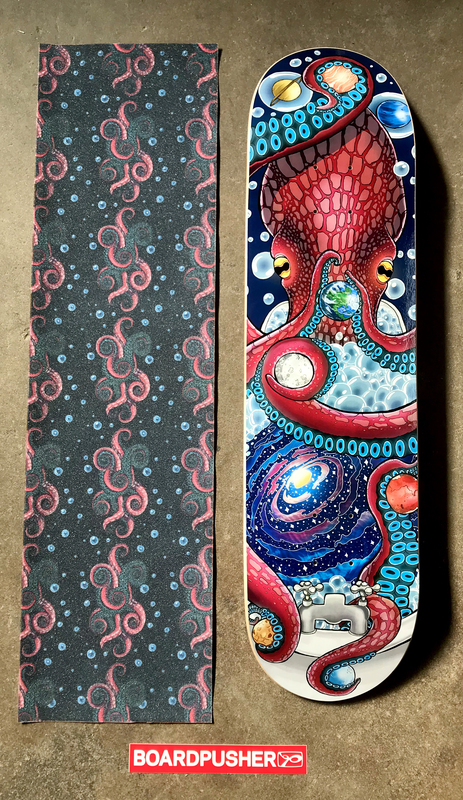 Choose a size that fits your needs and design your own custom griptape at BoardPusher.com. 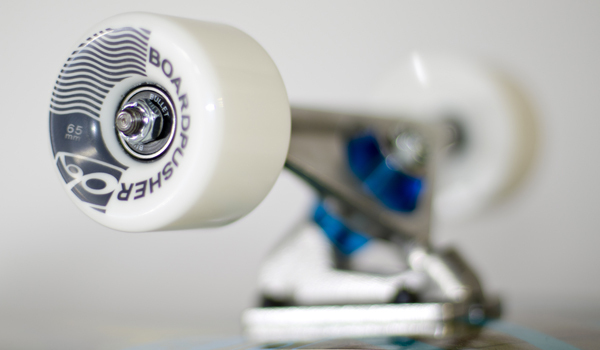 We have added a new all purpose longboard wheel to BoardPusher.com. These center set wheels are soft enough to grip the concrete and still ride over any pesky bumps in the road. The square inner edge helps push through turns and maintain control. Best of all, they are now part of the basic components package when making your custom longboard a complete. You can also add them to your favorite cruiser shape or popsicle complete for a faster ride.